Beautifully furnished with a light & airy feel throughout, this villa is ideal for a relaxing holiday with plenty of facilities to keep you all entertained. Fantastic for families with children of all ages. 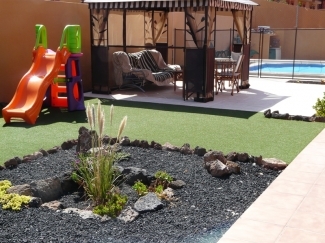 Situated in a peaceful area with panoramic sea & mountain views, but still only a short distance into the main resort of Corralejo. 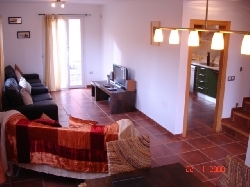 A luxurious & spacious semi-detached villa with lovely private solar heated swimming pool, sleeping up to 7 people. There are 3 double bedrooms, 2 bathrooms, downstairs cloakroom, open plan living/dining room and fully fitted kitchen. 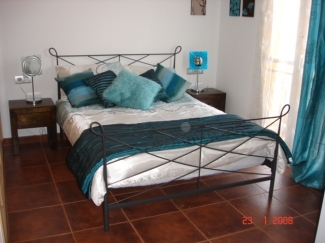 The whole house has a wonderful light & airy feel & is furnished to a very high standard. Downstairs, the lounge has french doors leading out to the large private sun terrace and swimming pool. There are 2 comfortable leather sofas, a flat screen TV with satellite channels in English, a DVD player & hi-fi system with USB port for your MP3 players! The beautiful darkwood dining table seats 6 in comfort & there is also a library of DVDs, CDs & books, a selection of family games & children's toys. The separate kitchen has an oven, ceramic hob, dishwasher, washing machine, fridge freezer, microwave, kettle, toaster, sandwich toaster, plenty of crockery, cutlery, pans, etc - pretty much everything you need for that home from home holiday, but in the sun! Upstairs there is a fabulous king size 4 poster bed, a master bedroom with double bed & en suite shower room & a twin room complete with TV, video, DVD, playstation & a selection of games. The four poster room & twin room have french doors opening out onto a small 'Juliet' balcony which overlooks the rear terrace & swimming pool. All bedrooms have ample storage & are beautifully & comfortably furnished, complete with tall fans to keep you cool during the balmy Canarian nights. The main bathroom has a bath with shower over, washbasin, WC & bidet. Stairs from the landing outside the bedrooms (stairgates available for both sets of stairs to protect young children) lead to the upper roof terrace where there is a dining table & chairs from which you can take advantage of the stunning views - of the sea, sand dunes & the islands of Lobos & Lanzarote. The villa has a large garden area which captures the sun from early morning to late afternoon, but we have also provided a pergola & a gazebo for those times when you want to get out of the sun! There is a lovely private swimming pool with a high quality SAFETY FENCE for the protection of small children & the peace of mind of parents! This fence is removeable so that groups of adults &/or guests with older children do not need to have the fence in place. A large tiled terrace area, BBQ, Pool Table/Electric Air Hockey game, Basketball net, soft play area for children with artificial putting grass, GOLF hole, lovely gazebo with a sofa & table & plenty of patio furniture for the all important sunbathing & al fresco dining all help you to enjoy the fabulous year-round sunshine in total comfort. 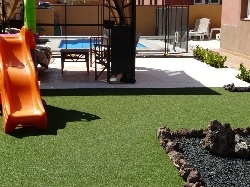 We also provide beach toys, pool inflatables, a ride on tractor, bats & balls & a children's slide &/or playhouse. At the front of the villa is a private driveway with an electrically operated lockable gate, making it safe for children. There is also plenty of parking space immediately in front of the driveway. The villa is fully alarmed, with a simple keyfob operation for your convenience. 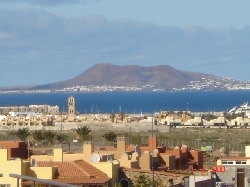 Mirador de Las Dunas is a residential complex situated in the Parque Natural area on the edge of the ever popular town of Corralejo, with its stunning beaches, friendly and relaxed atmosphere, abundant shops and restaurants & great water park. The complex is in a front-line position to the beautiful, protected sand dunes of Corralejo, with unimpeded views of the sea & the islands of Lobos & Lanzarote. It is bordered by protected park land & also has panoramic mountain views. It has attractive palm-lined walkways both within and around it, and, as it backs directly onto the sand dunes, it is possible to walk across them to the gorgeous beaches near the 2 RIU hotels - this takes around 30 minutes. It is a gated community & has a large communal pool area with a wonderful lagoon style swimming pool, a smaller shallow pool for children & a hot tub. This is only a couple of minutes walk from the villa. As the complex is residential, it is amazingly quiet and tranquil, making it the perfect place to literally 'get away from it all', but with the benefit of the lively bars & restaurants of the main resort, plus the famous sand dunes beaches only a few minutes drive away. 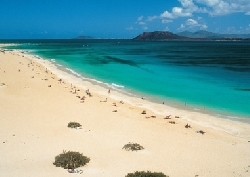 There are also some lovely beaches in and around Corralejo which are clean & safe for small children & have the added benefit of beachside bars & restaurants. The location is approximately 30 mins drive from the international airport in the capital of Puerto del Rosario and approximately 5 mins by car into the main resort of Corralejo (about 5 Euros in a taxi). The famous sand dune beaches are approx 5 mins drive away (5� in a taxi), the nearest supermarket & restaurant 5 mins walk, with a larger selection plus a bank about 15 mins walk (2 mins in the car). It is roughly a 30 min walk to the resort centre. There are many other lovely beaches on the island, including the lagoons at El Cotillo (about 20 mins drive) and also some lovely places to visit in the Canarian villages. The roads are extremely good and never crowded - driving around the island is a pretty relaxing experience & well worth the effort! Corralejo caters for all ages & there's a wide variety of things to do - watersports, tennis, boat trips, ferry trips to Lanzarote, Jeep Safaris, Island tours, Mountain biking, Motorbike tours etc. The Baku Water Park provides hours of fun for the whole family. With 3000 hours of sunshine a year, the weather conditions of Fuerteventura are very similar to Florida and Mexico, but without the humidity, making this the ideal holiday location all year round. There is nowhere else in the Canaries with as many enormous sand dunes and long sandy beaches (more than one hundred and fifty). Even though most of the land consists of stone and rock, these are some of the most impressive beaches in the whole of Europe. Water sports are very popular in Fuerteventura. Every year hundreds of surfers, windsurfers and divers descend on Fuerteventura and during July the island is host to the P.W.A world windsurfing speed and slalom event at Sotavento in the south. There are also many new attractions inviting tourists to discover different aspects of the Island's landscape and culture, such as the Betancuria Museum of Archaeology and Ethnography and Tefia Craft Village to name but a few. A championship golf course is just over a half hour drive away. Based on 6 people sharing - add �100/�115 per person per week (�200/�250 in high season) for groups of more than 6. During off peak periods, please enquire about any SPECIAL RATES FOR COUPLES or a discount on a last minute booking. 25% deposit required upon booking, with the balance due within 6 weeks of your departure date. Preferred method of payment is bank transfer. We can accept bank transfers in GBP or Euros. We can also accept debit/credit card payments through Paypal, preferably in Euros. A refundable security deposit of �100/�150 is also required upon payment of the balance. Very competitive prices for school holiday periods.